The driver and tour guide were very professional and timely. We thoroughly enjoyed this tour and would recommend it as a post cruise tour. IT TOOK ALMOST 3 HOURS TO GET FROM OUR PICK UP POINT TO THE CASTLE. THEN WE HAD TO WALK UP A STEEP INCLINE TO REACH THE CASTLE. I GUESS COACHES WERE NOT ALLOWED BUT TAXIS DROVE RIGHT UP TO THE STARTING POINT. THIS EXCURSION SPENT ALOT OF TIME PICKING UP OTHERS AT UNUSUAL HOTELS,WE HAD TO MAKE A STOP AT THE AIRPORT(THOSE PEOPLE HAD BEEN GIVEN THE WRONG PICK UP TIME AND WE HAD TO WAIT). WE MADE STOPS AT OTHER CASTLES BECAUSE SOME HAD ALREADY BEEN TO DOVER. BY THE TIME WE GOT THERE,WALK UP THE HILL AND MINIMAL TIME TO EXPLORE. This was absolutely perfect. If you need a transfer from London to Dover, this worked out perfect for us. Other than spending about 2 hrs on the bus picking up people from hotels, it was well worth it. For us, it appeared the 3 of us were the only ones going to Dover Castle. 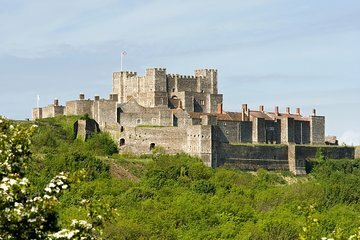 So after a short stop at the pier to drop off luggage and passengers, the driver took the 3 of us to Dover Castle for our "excursion". I'd say the only negative was there was not enough time. It's a huge place and you need lots of time to explore. We didn't get thru the tunnels, but made the hospital, which is similar. Also have to make the Tower. It was well worth it, becuz we got to do something other than wait on the ship for 5 hrs before departing. Trip to Dover was smooth. They arrived at our hotel earlier than we had been told. Fortunately, we were ready early. From the time we were picked up at our hotel to the time we arrived at Dover Castle, 5 hours had passed. It's a two hour trip from London to Dover. The balance of the 5 hours was spent picking up people from other hotels in London, waiting at Victoria Station, and picking up more people from hotels near Heathrow. We enjoyed Dover Castle, and the cost of the transportation from London to Dover was reasonable, but I can't recommend this to anyone. Weigh your options. Dover Castle, itself, was excellent.